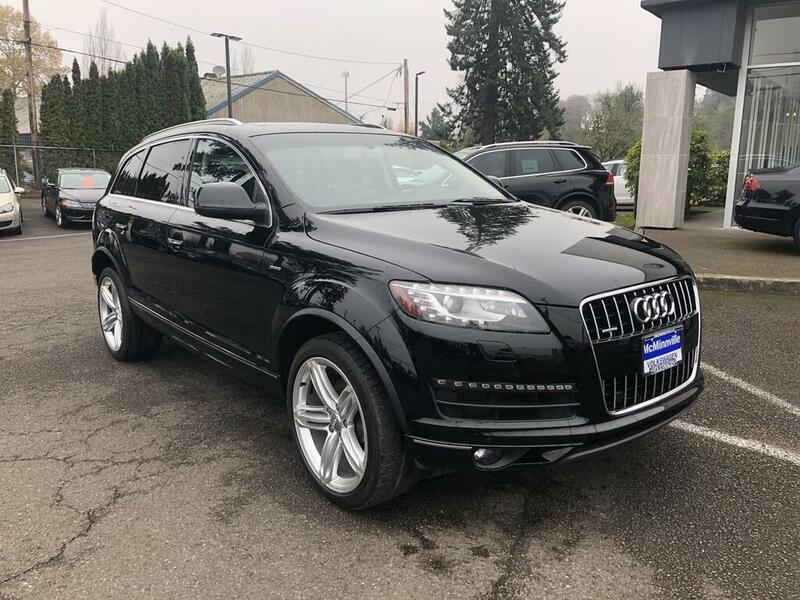 Our Accident-Free, One-Owner 2015 Audi Q7 3.0T Premium quattro presented in Black combines luxurious driving with impressive sport capabilities and the latest technology. The SuperCharged 3.0 Liter V6 generates 280hp on demand and is tethered to a smooth-shifting 8 Speed Automatic transmission. The brilliant driving dynamics are enhanced by the sure-footed prowess of All Wheel Drive that provides ample grip and control. You'll also enjoy impressive acceleration and the ability to score near 22mpg out on the open road. This full-size luxury SUV is a true head-turner with alloy wheels, roof rails, adaptive xenon headlights, LED running lights and a power liftgate.The cabin of the Q7 Premium exudes an understated elegance and has been thoughtfully crafted with your needs and desires in mind. Enjoy the sensation of power heated leather front seats, a panoramic sunroof, dual-zone climate control and the convenience of a reclining split second-row seat. You'll stay connected via Bluetooth, appreciate the ease of our Multi Media Interface, and listen to an incredible sound system as you take in all that this premium ride has to offer. And be confident behind the wheel since Audi has a reputation for safety that continues throughout the Q7. You've got to get behind the wheel of this beautiful SUV to see for yourself. Print this page and call us Now... We Know You Will Enjoy Your Test Drive Towards Ownership!